The inn at new Hyde park is a gorgeous venue. It is located on Jericho Turnpike in New Hyde Park, Long Island, NY one of many extraordinary venues to get married.They have a beautiful outdoor area for taking photos as well as having your wedding ceremony.The venue has two large ballrooms to have your wedding and/or other event like Sweet Sixteen, engagement party or Bar and Bat Mitzvah.The Georgian ballroom has beautiful white walls, crown molding and can accommodate weddings of up to 500 guests and beautiful crystal chandeliers.We had the pleasure of being hired to be my best friends Long Island wedding photographers at the Inn at New Hyde Park.The outdoor area at the Inn at New Hyde Park has a stunning waterfall and 2 gazebos perfect for outdoor wedding ceremonies as well as wedding photos of the bride and groom captured by the best wedding photographers Starlight Studioz. Jericho Turnpike is the home of many popular wedding venues in Long Island New York where beautiful images of weddings car captured of bride and grooms and bridal parties. The Inn at New Hyde Park is on top of that list and considered more high end with a greater cost per guest. There are several other beautiful venues that you can book to capture your wedding memeories and photos located on Jericho Tpke other that the Inn at New Hyde Park including Crest Hollow Country Club, Jericho Terrace, North Ritz Club, Fox Hollow and Westbury Manor. 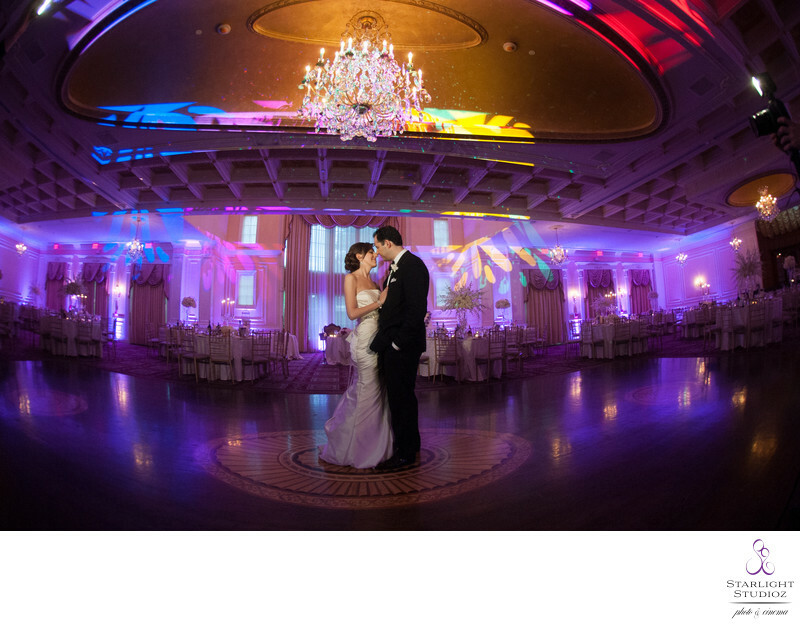 This wedding photo is of our couple Alexandra & Richard in the Georgian ballroom before reception at the Inn at New Hyde Park. Our wedding day preparations started out in Forest Hills, where we had the first look before heading out the Old Westbury Gardens in Long Island. The Old Westbury Gardens is super strict with their permits, it is required to obtain one in advance of taking your Long Island wedding day photos.They can only accommodate a certain number of couples at a time so it's extremely important to book ahead of time to ensure you can capture your wedding pictures at this Long Island location.They give you choices on different areas of the gardens you are able to capture you photos in the Old Westbury gardens. Once we arrived at the venue along with the bridal we took family photos on the putting green. We had time to take additional wedding pictures of the bride and groom by the waterfall, pond, and bridge and outdoor gardens before signing of the ketubah and wedding ceremony began. Location: 214 Jericho Tpke, New Hyde Park, NY 11040.